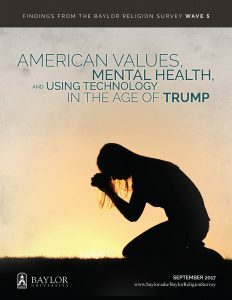 “American Values, Mental Health, and Using Technology in the Age of Trump” presents preliminary results from The Baylor Religion Survey Wave V, a random sample of 1,501 adults, which was administered by the Gallup Organization in the spring of 2017, during the first months of Trump’s Presidency. We focus on four key areas of interest: 1) the religious, political, and ideological values of Trump voters, 2) mental health and religion in American today, 3) the intersection of technology and religion, and 4) the geography of religion. 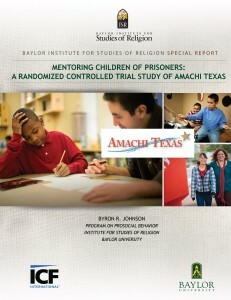 With funding from the Templeton Foundation, The Baylor Religion Survey is the most extensive and sensitive study of religion ever conducted, linking up with the pioneering surveys conducted by Rodney Stark and Charles Y. Glock in the 1960s. 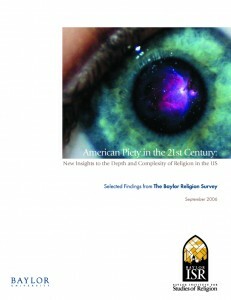 With the Baylor Religion Survey, we were able to dig deeper into American religious attitudes, behaviors and beliefs than previously possible. 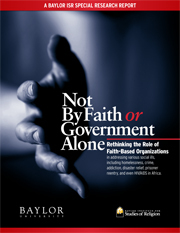 Preliminary findings related to the measurement of religion, the nature of religious belief, the relationship between religion and moral and political attitudes, and religious spending habits were released in Wave 1 at the National Press Club on September 11, 2006, in this research report.